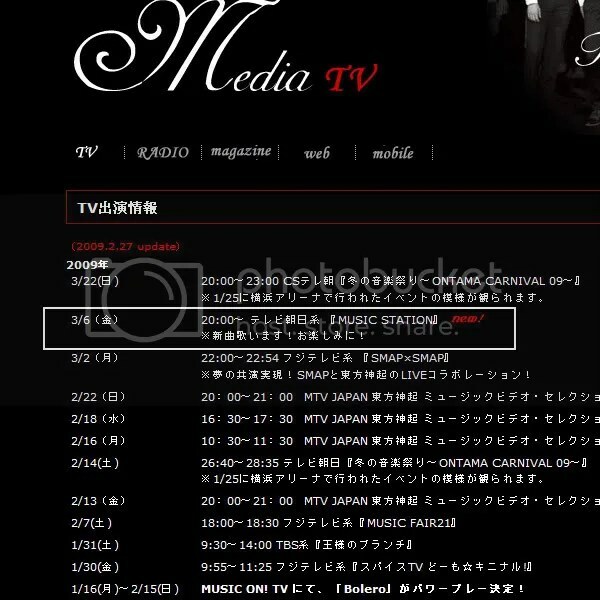 [News] Tohoshinki to be on Music Station… Finally? We did a story back in July of 2008, asking why it seemed THSK was banned on Japan’s Music Station? Then it seems relations were improving when we wrote about SM Entertainment and Johnny’s Entertainment being more friendly to each other. Still no invitation to Music Station but an invitation to SMAPxSMAP. Well, after all this time it seems THSK was finally invited to perform on Music Station! This entry was posted on February 27, 2009 at 2:27 PM and is filed under News with tags THSK, Tohoshinki. You can follow any responses to this entry through the RSS 2.0 feed. You can leave a response, or trackback from your own site.